President Donald Trump walks after stepping off Marine One on the South Lawn of the White House on April 6. With the 2020 presidential campaign ramping up and the Democratic field of presidential hopefuls growing, President Donald Trump’s ability to secure a second term in office could hinge on his ability to weather an economic slowdown in the coming months. Historically, most incumbent presidents have been successful in winning a second term in the White House, with just five exceptions, the most recent being George H.W. Bush in 1992. The common thread shared by those one-term presidents was “either recession or a major economic blip,” O’Connell said. “In the last two years, we’ve embarked on an unprecedented economic revival. Unprecedented,” the president said during a rally last month in Grand Rapids, Mich. But while growth from the fourth quarter of 2017 to the fourth quarter of 2018 stands at 3 percent, the president said the U.S. economy would have grown by more than 4 percent had it not been for the Federal Reserve’s raising of interest rates. The central bank indicated recently that it would not hike rates at all this year. While the president is optimistic in his view of the economy, there is daylight between the White House’s expectations for the economy and those of other institutions. The Commerce Department last month revised its estimates for economic growth in the fourth quarter of 2018 from 2.6 percent to 2.2 percent. Additionally, a recent outlook survey from the National Association for Business Economics predicts economic growth will slow from 2019 to 2020. The Federal Reserve predicted in March that the economy would grow at a rate of 2.1 percent, while the Trump administration predicts 3.2 percent growth for 2019. In Colorado, the quarterly survey of business leaders by the University of Colorado Boulder's Leeds School of Business, released April 2, showed that while executives were more optimistic about both the state and national economy's prospects than they were the previous quarter, their optimism level was well below what it was a year earlier. And, looking ahead to the second half of the year, the CU/Leeds survey showed Colorado business leaders' outlook as more negative than at any point since late 2011. Though the next election remains 19 months away, a number of Democrats -- including former Colorado Gov. 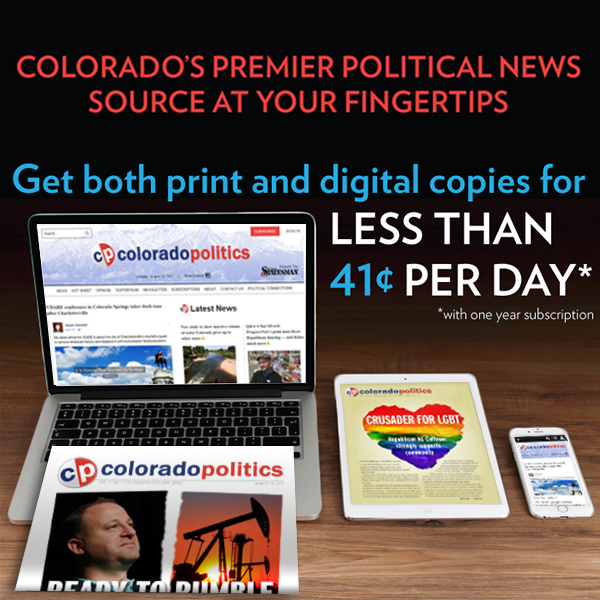 John Hickenlooper -- have announced their candidacies, and the field is expected to get even more crowded. Colorado Sen. Michael Bennet says he'll enter the race if he is found to be free of prostate cancer following surgery. O’Connell said those attacks could help the president’s chances of reelection, particularly if economic growth stalls. Though it’s difficult to predict turns in the economy despite forecasters’ best efforts, Adam Michel, a senior policy analyst at the Heritage Foundation, said he expects the tax cuts implemented as part of the GOP’s $1.5 trillion tax package, as well as the Trump administration’s deregulatory push, will continue to have a positive effect on the economy for the foreseeable future. “The story that’s being most told is the tax cuts are some sort of sugar high, like the government writing a check, and they’re the opposite of that,” Michel said. Michel acknowledged there are some headwinds, including the failure to address the deficit and national debt, which he said is a “drag on the economy.” Other challenges could be the global economic slowdown currently occurring, as well as the uncertainty surrounding the United Kingdom’s exit from the European Union, Michel added. But Paul Kellstedt, a professor at Texas A&M University, said the state of the economy is unlikely to move “hard-core partisans,” regardless of how strong it may be, an indication of how polarized the country has become. “Republicans already approve of [Trump], Democrats already disapprove of him, and no measure of economy prosperity is going to change the way Democrats view this particular president,” he said. The announcement is expected as early as Wednesday.